Hemochromatosis is pathologically associated with accumulation of hemosiderin/ iron into the liver, kidneys, pituitary, testes, adrenals, hearts and skin. 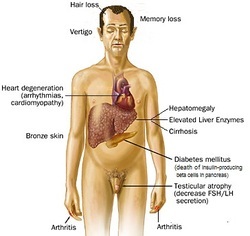 The hemochromatosis is presented with enlarged and deep brown color liver. hemochromatosis is associted with hemosiderin accumulation of the parenchymal in the periportal hepatocytes . This will finally leads to cirrhosis. There will be a mild elevation of the liver enzyme , increase iron in the serum, increase serum ferritin, increase saturation of transferrin and decrease total iron binding capacity. Primary hemochromatosis is an autosomal recessive condition. In this case, it involves the excessive absorption of iron in he mucosal of the intestine. Primary hemochromatosis is associated with mutation of the chromosome no 6 as well as HLA - A3. Secondary hemochromatosis is acquired disorder due to thalassemia , ineffective erythropoiesis and iron overload syndrome which may occur due to chronic transfusion therapy. Hemochromatosis may be prevented by screening for increase in saturation of transferrin during the period of neonatal. This is done to avoid the incidence of primary hemochromatosis in newborn/genetically disorders. Other treatments include deferoxamine administration and phlebotomy which is done routinely. Hemochromatosis mostly start at 50 years of age. It is common in west and northern europe. Patient may present with bronze diabetes /hyperpigmentation of the skin, diabetes and cirrhosis. Besides that on examination patient may present with cardiac disease/cardiomegaly, arthropathy/arthritis and hepatomegaly. There is a high risk of developing of hepatocellular carcinoma and increase risk of infection from iron loving organism such as listeria or vibrio vulnificus. 1.Khan, Fida A., Melanie A. Fisher, and Rashida A. Khakoo. “Association of Hemochromatosis with Infectious Diseases: Expanding Spectrum.” International Journal of Infectious Diseases 11, no. 6 (November 2007): 482–487. doi:10.1016/j.ijid.2007.04.007. 2.Pietrangelo, Antonello. “Hereditary Hemochromatosis — A New Look at an Old Disease.” New England Journal of Medicine 350, no. 23 (2004): 2383–2397. doi:10.1056/NEJMra031573. 3.Ross, C E, W A Muir, B P Alan, R C Graham, and R W Kellermeyer. “Hemochromatosis. Pathophysiologic and Genetic Considerations.” American Journal of Clinical Pathology 63, no. 2 (February 1975): 179–191.